Wilhelm Düerkop (born 30 June 1928 in Halberstadt) is a German glider and motor glider aerobatic pilot and promoter of glider aerobatics in Germany for many years. He is known by the nickname Salzmann (meaning "salt man" in German). This is because he was a pit foreman in a salt mine. Together with his colleague Hannes Mattes, he performed synchronised motor glider acrobatics using a Fournier RF-4 and an RF-5 at many air shows, until Hannes Mattes died in 2004. Later, Wilhelm Düerkop joined the Skydance-Acro-Team and still performs motor glider aerobatics with an RF-4. He owned two Lo 100 gliders a yellow one (christened "Gilb") and a white one, but he now has a modified Schempp-Hirth Cirrus, known as a Cirrus K ("Langohr Eater"). To help promote glider aerobatics, Düerkop lends his gliders to both learners and competition pilots. He sometimes trains advanced learners on aerobatics courses  but he especially helps as the tow pilot using his Piper PA-18 "D-ELUF". He has also volunteered at many glider aerobatics events. 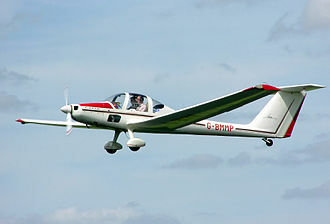 The modification of a Standard Cirrus into a Cirrus K was initiated by Wilhelm Düerkop in the late 1980s. He still owns the prototype, while the second one is owned by his nephew Wolfgang Seitz. The Lo100 "Gilb" is now owned by the Förderverein Segelkunstflug im BWLV. It is regularly lent for use on aerobatic courses in Germany. An ASK 21 that is owned by the glider aerobatics club Fördervereins für Segelkunstflug im BWLV e.V. has been christened "Salzlore", which means "salt lorry" in German, after Wilhelm "Salzmann" Düerkop and the president of the aeroclub of Baden-Württemberg Lore Sturm. This club was founded in 1985 and has about 1250 members. The German club championships in glider aerobatics are named Salzmann-Cup after Wilhelm "Salzmann" Düerkop. There are three classes in each competition: the sportsman class, the advanced class and the unlimited class. The Salzmann-Cup plays a similar role as state championships in Germany. In the unlimited category, it is a qualification contest for joining the national team. A team prize is also presented based on the combined results in all the classes for the pilots of each club. Additionally, the title "Salzmann des Jahres" (Salt Man of the Year) is awarded for unselfish conduct and sportsmanship. The first club championships took place in Nagold in 2000 and 2001 as "Nagoldtal-Cup", initiated by Michael Zistler. Since 2002, the club championships are organized at different German airfields each year on Corpus Christi day and the following weekend. During the 2007 event, the Förderverein Kunstflug Aufschwung Ost (regional glider aerobatics club of east Germany) was founded. International Miniature Aerobatic Club is a non-profit organization devoted to flying scale aerobatic model aircraft. IMAC is the governing body responsible for hosting precision aerobatic contests with hundreds of pilots across the United States. The organization was founded in 1974 with 97 chartered members, for safety reasons, IMAC competitions are hosted only at Academy of Model Aeronautics or Model Aeronautics Association of Canada sanctioned flying clubs. IMAC contests are segregated into five levels with an optional sixth class at some events. In addition to programs, a pilot is given unknown programs the day of the competition that can only be attempted once. If a contestant wins five contests in a season, they are required to advance to the higher class at the beginning of the new season. Open to all pilots with a monoplane or biplane aircraft, aircraft at this level do not require a model pilot or dashboard. Unknown programs are limited to one full roll on any line and one roll on any 45 degree line. Unknown programs cannot contain combination roll elements, unknown programs cannot exceed 1½ rolls on combination or single roll elements, excluding spins. Unknown programs are limited to a roll with any looping maneuvers. Unknown programs cannot exceed 2 rolls on combination or single roll elements, unknown programs are limited to 1½ rolls with any looping maneuvers. Unknown programs cannot exceed 2 rolls on combination or single roll elements, unknown programs are limited to 2½ rolls for downline, and 3 rolls for up line, combination roll elements. Requires pilot to compete in one of the five classes to be eligible. Separate awards offered from main competition, pilots are judge on a combination of Technical Merit, Artistic Impression, and Positioning. Sequences within each class are described using Aresti notation and this provides a standard method of documenting aerobatic maneuvers permitted within each class level for both pilots and judges. Pilots are judged on the quality and precision of their flying skills, each year, an official IMAC committee reviews the flying sequences within each class to makes adjustments as well as to offer new challenges for pilots. Nagold is a town in southwestern Germany, bordering the Northern Black Forest. It is located in the Landkreis of Calw, Nagold is known for its ruined castle, Hohennagold Castle, and for its road viaduct. It takes its name from the river Nagold, which flows through the town, Nagold has a beautiful city centre where half-timbered houses and modern architecture meet each other. The following small villages belong to the district of Nagold, Emmingen, Gündringen, Iselshausen, Pfrondorf, the Nagold Basin was probably settled as early as the early Stone Age,2000 to 3000 BCE. With its fertile soil and mild climate in the low mountain ridge, traces of early human occupation from the Hallstatt culture have been found in the Bächle area. The Celts were in the Nagold basin by the 6th and 5th centuries BCE and they were responsible for naming the river Nagold, meaning flowing stretch of water. A Celtic royal burial mound and signs of settlements and graves have been found on Schlossberg. By the 1st century, the Romans had established two settlements in the basin, one of these settlements was unearthed in the 7th century during construction of Remigiuskirche. Stone walls from the remains were used in the Remigiuskirche foundation, the Alamanni expelled the Romans from the Nagold Basin around 260. They emphasized settlement of the valley, and expanded their territory, around 700, the Franks conquered the Alamanni. The Remigiuskirche was built during this time, and it is assumed the Franks established a court in the area, Nagold became the administrative center of the region which extended from Bondorf to Kniebis. Small towns and settlements began to spring up around Nagold, pfalzgraf Rudolf von Tübingen established Nagold as a city early in the 13th century in order to protect his holdings in the northern Black Forest. Through marriage in the year 1230, Nagold came under the control of the Grafen von Hohenberg, by the end of the 13th century, Nagold was encircled with a 5. 5-metre-high wall, complete with moat and gate towers. Around 1350, the Plague devastated the population, construction was begun on Marienkirche church in 1360. The church was razed in 1876-1877, but a tower built in 1401 still stands on Turmstrasse street. Basic Fighter Maneuvering theory recognizes two different types of scissors maneuvers, the flat scissors and the rolling scissors. The flat scissors is the simpler of the two to explain, after the co-planar overshoot, if the bandit chooses to remain engaged with a nose-to-nose turn to either gain the advantage, or maintain the neutral situation, the flat scissors is a common result. Once initiated by the bandit, it is very difficult for the bandit to disengage from a flat scissors without being exposed to danger from the weapons of the other aircraft. An experienced and patient bandit might be able to turn the scissors to his advantage, in any case, if both pilots reaction to a co-planar overshoot with only a minor air-speed differential is a co-planar nose-to-nose turn, a flat scissors will often result. The resulting flight path looks like scissors in the sense that both fighters approach each other, cross over, and again and over while the scissors continues. This process of 180 degree rolls and reversed turns can be repeated many times while each pilot seeks a positional advantage through energy management, for this attacker the objective is to avoid the scissors against such a bandit. There are at least two ways an attacker can avoid becoming engaged in a flat scissors. Such an attacker who recognizes that he is about to overshoot a bandit could, upon seeing the initial turn. The bandit at this time having probably pulled a hard turn will have lost energy as a consequence of the high-G turn. This vertical maneuver has allowed the attacker to put distance between itself and the bandit that might serve to foil a shot due to being out of range. The attacker is now in the position to dive in for attack, or to disengage. The bandit, on the hand, has depleted its energy in its initial turn, is below the attacker. Note however that the aim of the attacker possessing an aircraft with superior power or energy and this might require reducing energy/air speed using flaps, reduced throttle settings, or other means at its disposal. Energy is valuable, and should only be depleted as necessary to avoid the overshoot, excess depletion of energy is never a good idea. Thus the point again is to use an advantage to entering the scissors maneuver. The Schempp-Hirth Cirrus is an Open Class glider built by Schempp-Hirth between 1967 and 1971 and by VTC until 1977. The Cirrus was designed by Dipl. -Ing, klaus Holighaus and was the first glass-fibre glider to be built by Schempp-Hirth. The prototype flew in 1967 with a V-tail like the Austria and it won the German Open Class in 1967. By 1971107 had been built in Germany, production was transferred to Vazduhoplovno Tehnicki Centar at Vršac in Yugoslavia, who built an additional 63. Haro Wodl won the 1968 World Gliding Championships in the class with a Cirrus. The resultant Cirrus has mid-set cantilever wings with a span of 17.74 metres, and it can carry water-ballast in the wings. For glidepath control, there are effective top-and-bottom air brakes and a drag chute built into the bottom of the rudder. Holighaus chose a rather thick flapless Wortmann airfoil which had low drag, the span and profile are optimised for the weaker gliding weather of central Europe. The result is excellent thermalling characteristics and a glide ratio. A falling leaf is an aerobatic maneuver in which an aircraft performs a wings-level stall which begins to induce a spin. This spin is countered with the rudder, which begins a spin in the direction that must be countered with rudder. 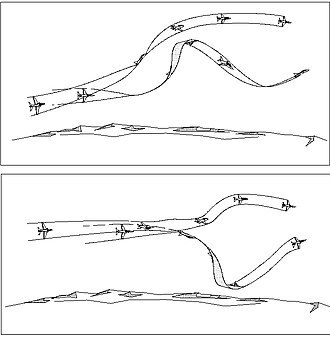 A falling leaf is a controlled stall performed in a fixed-wing aircraft, the maneuver is performed by purposely stalling the airplane and carefully using the rudder to try to hold the aircraft on a steady course. The falling leaf consists of a constant rotation about the yaw axis while continually changing the direction and this is opposed to a flat spin, where the aircraft constantly rotates around its yaw axis in only one direction, similar to a Frisbee. The falling leaf is sometimes described as walking the aircraft while stalled. The maneuver is performed mostly with the rudder, trimming with the elevator. 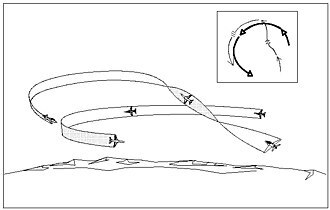 The rotation may be self-induced, called autorotation, or, in maneuvers like the falling leaf, the incipient spin begins when the aircraft first starts to rotate around the yaw axis. The rotation causes one wing to move faster than the other, as the aircraft rolls it slips sideways. If the spin is not stopped, the plane continue to roll and slip until it is in an out-of-control. However, if rudder is used to stop the incipient spin before it becomes a full spin, in this case the incipient spin will begin in the opposite direction, so it must be stopped again, and the process is repeated throughout the maneuver. The falling leaf is used as a training maneuver, teaching the pilot to control the plane during a stall. 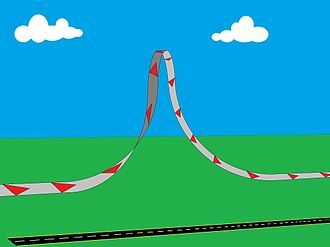 It is generally performed from a low-speed, level stall, to avoid the buffeting, departure from the normal flightpath and it is used in aerobatic competitions and shows as a demonstration maneuver. As the speed drops, the pilot holds the plane as level as possible in both the direction and the lateral direction. When the stall speed is reached, the plane will lose lift, due to the low speed and high angle of attack, the aircraft loses its boundary layer, making the control surfaces barely responsive to pilot inputs. 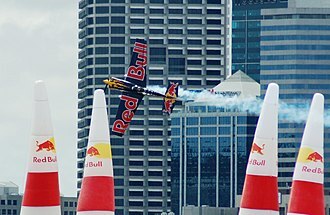 A whifferdill turn refers to any number of fancy aerobatic maneuvers performed in an aerial flight show or while flying aggressively. It is a turn with both horizontal and vertical components, usually performed at the end of one maneuver in preparation for the next. As the plane is climbing the pilot makes a turn reversal, aviators often use the term as slang for any multi-axis movement or comical / interesting / unusual movement. The whifferdill is an aerial warfare maneuver that is used to reverse course in a dogfight with very little loss of energy/airspeed. It is a fundamental maneuver used in air shows, in astronautics, a whifferdill is a maneuver used during orbital rendezvous when the target is on a different orbital plane from the piloted vehicle. Due to the nature of orbits, the target will seem to make a helical motion relative to vehicle as the orbit progresses, a wifferdill maneuver is used to quickly realign the orbital plane of the vehicle with the target and stay near the targets orbital position or mean anomaly. Halberstadt is a town in the German state of Saxony-Anhalt, the capital of Harz district. Located north of the Harz mountain range, it is known for its old town centre that was damaged in World War II. Halberstadt is situated between the Harz in the south and the Huy hills in the north on the Holtemme and Goldbach rivers, the municipal area comprises the villages of Aspenstedt, Langenstein and Ströbeck, all incorporated in 2010. Halberstadt is the base of the Department of Public Management of the Hochschule Harz University of Applied Studies, the town centre retains many important historic buildings and much of its ancient townscape. Notable places in Halberstadt include Halberstadt Cathedral, the Church of Our Lady and St Martins, Halberstadt is the site of the first documented large, permanent pipe organ installation in 1361. The cathedral is notable among those in northern European towns in having retained its medieval treasury in virtually complete condition, among its treasures are the oldest surviving tapestries in Europe, dating from the 12th century. The town is a stop on the scenic German Timber-Frame Road The town can be reached via the Bundesstraße 6n,79,81, Halberstadt main station is an important railway hub on the Magdeburg–Thale and Halle–Vienenburg lines, mainly served by Transdev Sachsen-Anhalt. The Halberstadt tramway network currently operates two lines, germania Halberstadt is a football club which plays in Halberstadt. In 814 the Carolingian emperor Louis the Pious made the Christian mission in the German stem duchy of Saxony the episcopal see of the Diocese of Halberstadt and it was vested with market rights by King Otto III in 989. The town became the centre of the Saxon Harzgau and an important trading venue. The Halberstadt bishops had the Church of Our Lady erected from about 1005 onwards, in his fierce conflict with Emperor Frederick Barbarossa, the forces of the Saxon duke Henry the Lion devastated the town in 1179. Upon Henrys downfall, the Halberstadt diocese was elevated to a prince-bishopric about 1180 and its Cathedral was rebuilt from 1236 and consecrated in 1491. A motor glider is a fixed-wing aircraft that can be flown with or without engine power. The FAI Gliding Commission Sporting Code definition is, a fixed-wing aerodyne equipped with a means of propulsion, capable of sustained soaring flight without thrust from the means of propulsion. In the US, a powered glider may be certificated for up to two occupants, up to 850 kg maximum weight, and with a ratio of weight to wing span squared of 3 kg/m2. Similar requirements exist in European JAA/EASA regulations, at a weight of 750 kg. In 1935, an occasional or auxiliary motor that could be retracted was suggested by Sir John Carden and this was incorporated into the Carden-Baynes Auxiliary that first flew on 8 August of the same year. Most motor gliders are equipped with a propeller, which may be fixed, Motor with fixed or full feathering propellers are generally classified as Touring Motor Gliders. TMGs can take off and cruise like an airplane or soar with power off and they are fitted with front-mounted engines, similar to a small airplane. The large wingspans of TMGs provide a moderate gliding performance, not as good as that of unpowered gliders, however TMGs are more efficient than conventional light aircraft. Most TMGs are designed with engines of 80 to 100 hp, most have fuel tanks capable of holding between 50 and 100 liters of fuel, giving a range under power of up to 450 nautical miles. Modern TMGs like the Phoenix Air Phoenix are capable of higher speeds, some TMGs are equipped with folding wings to allow them to fit in standard small airplane T-hangars. 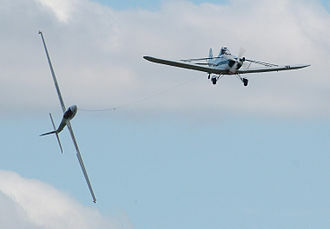 Tow hooks are unnecessary, since aircraft with self-launch ability do not require access to winch or tow plane for launching like a conventional glider. Some TMGs, like the Europa or the Phoenix, can be supplied with interchangeable wings or wingtips so that they can be flown as a touring aircraft as well as a TMG. The landing gear configuration on TMGs usually incorporates two fixed main wheels, allowing it to be taxied on the ground without a wing walker, since the additional drag of the stopped propeller and landing gear reduces their gliding performance, TMGs are seldom used in competition. Grob G109B touring motor glider, with fibre-reinforced plastic construction. Schleicher ASH 26e self-launching motor glider, with the engine mast extended. A Stemme S10 is in the background with the nose cone extended. Piper PA-18-150 Super Cub lands at the 2017 RIAT, England. Built 1958.
Notable half-timbered house in Nagold. The Old Synagogue in Kitzingen. The Crooked Tower (Falterturm) in Kitzingen. Diorama of an underground salt mine in Germany. Inside Salina Veche, in Slănic, Prahova, Romania. The railing (lower middle) gives the viewer an idea of scale. Kloster Heilig Kreuz church, Decorations above the main altar. Slow rolls being performed by the Blue Angels while in formation. 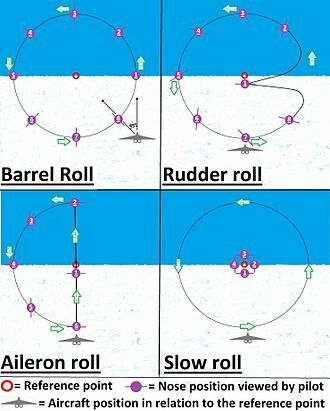 A slow roll as seen from the pilot's perspective, when in comparison with other types of rolls. International Miniature Aerobatics Club organization logo. Aerobatic model aircraft flying an IMAC sequence. The DH 108—the missile-shaped objects on the wing tips are containers for anti-spin parachutes. A diagram of the flat scissors.